In a large sauce pan, melt butter on medium heat and add flour, salt, and garlic powder. Use a whisk to combine until it bubbles. Add the milk and stir occasionally, bringing it to a simmer. Let simmer for approximately five minutes or until it begins to thicken. Turn down the heat to low and add the Salsa Fresca and the cheeses, mixing until everything is melted and gooey and delicious. Serve immediately, nice and hot, over chips and top with whatever you like! Enjoy! First mix the tomato juice and drained Mamacita's Salsa Fresca Spicy juice in a small pitcher. Add vodka, celery seed, Worcestershire, salt and pepper, and pour over ice! Garnish with celery stalk, pickles, olives, or whatever you like! Enjoy! First mix milk, cornmeal, Salsa Fresca, sugar, salt, and egg together until completely combined. Then add the flour, turmeric, and baking powder, mixing well. Once thoroughly mixed, stir in the cheese and corn. Heat a pot with oil up to 325 degrees. Once it's up to temperature, begin frying the fritters using an ice cream scoop or large spoon to drop them, carefully, into the oil. Fry for 3 minutes, then turn fritter over, and fry for another 3 minutes or until golden brown. Let drain on paper towel and serve right away! First, preheat your oven to 400 degrees spray a cookie sheet with oil spray and pop open the crescent roll packages. Roll out the rectangles of dough on the pan, pressing edges together to form one large rectangle. Use a fork to poke holes in the dough to keep from puffing up. Bake for 10 minutes. Once the crust is done, let cool completely. 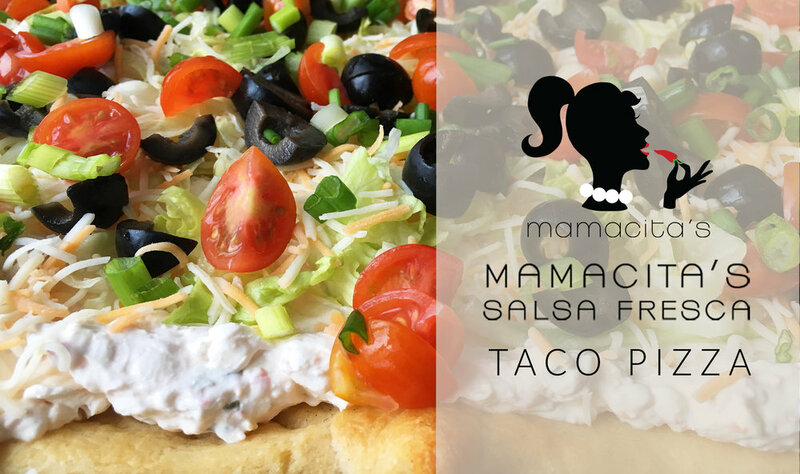 While the crust is baking, mix together cream cheese, drained Mamacita's Salsa Fresca, sour cream, and salt in a bowl. Cut up lettuce, tomatoes, black olives, and onion. Once the crust is cool, spread salsa mixture over the surface of the crust. Top with lettuce, shredded cheese, tomato, olives, and onion. First take softened cream cheese and mix into a bowl with a wooden spoon. Add the salt, garlic powder, and very well-drained Mamacita's Salsa Fresca—the less liquid the better to keep the ball firm. Once completely combined, place mixture on a large sheet of plastic wrap and carefully wrap it up, forming a ball as you go. Place on a plate in the fridge for 1 hour or more (even over night is fine) until more firm. While the cheese ball firms or just before done, chop parsley. Once the cheese ball is firm and ready, unwrap and keep the shape by continuing to form it with your fingers, and place at the center of the plate. Sprinkle and place chopped parsley on the entire surface, letting it stick and cover the cheese ball. Keep in fridge until ready to serve with crackers, chips, or cut vegetables! Enjoy! First, mix refried beans and Mamacita's Salsa Fresca in a small bowl. Then, layout pizza crust and spread bean and salsa mixture over the surface of the crust. Then, layer the cheese over the beans - however much cheese you like. Top with onion and pepper, then bake at 400 degrees for 20 minutes, or until cheese is melted and starting to get golden. Let cool, garnish with diced tomato, and serve! Enjoy! First preheat oven to 425 degrees. Then remove mushroom stems, setting them aside. On a sheet pan, spray with cooking spray and sprinkle a pinch of salt over the surface of the pan. Place stemmed mushroom caps on the pan and bake for 12-15 minutes. When done, use paper towel to soak up water from inside the caps, set aside to cool, and begin chopping all of the mushroom stems into fine pieces. In a skillet, on medium to high heat, add olive oil, mushroom stems, and a pinch of salt, stirring often until they are soft and most of the water has cooked out of the chopped mushroom stems. Add the chopped onion and sauté until onions are translucent. Remove from heat. In a large bowl, add cream cheese and pour over the still-warm mushrooms and onions to soften it, stirring in the monterey cheese, half of the breadcrumbs, Mamacita's Salsa Fresca, and salt and pepper to taste. Once everything is combined, spoon a heaping amount of the cheese mixture into the mushroom caps, sprinkle each with remaining breadcrumbs and broil until golden brown. Garnish with chopped parsley and serve warm! Enjoy! Rub potatoes with olive oil and salt, bake for 1 hour at 350 degrees or until soft. In the meantime, cut bacon into small pieces and fry in a skillet on medium heat until crispy. Drain on paper towel to remove grease. In a large bowl, combine cream cheese (either already at room temperature or warmed in the microwave), cheddar cheese, Mamacita's Salsa Fresca, salt and pepper, and half of the bacon pieces. When the potatoes are done, let cool until you can handle them. Cut potatoes in half, longways, and scoop out the centers leaving approximately 1/4 inch of potato with the skin. Add the scooped out potato into the bowl and combine all of it together. Place potato skins in a 9x13 baking dish and fill with cheesy potato mixture from the bowl. Bake for 40-45 minutes at 400 degrees. Once done, top with fresh green onion slices or chives, and the crispy bacon. In a 2-quart pot, add oil and brown the meat with the onion, stirring often. Once the meat is cooked, add Mamacita's Salsa Fresca, chili powder, salt, and pepper. Cook for approximately 5-10 minutes until the onions are soft and translucent. Add both beans and tomatoes, then stir. Cook for 20 minutes on low heat. If you like more liquid, add a little water to the mix. Serve with a garnish of sour cream and chopped green onion. Once the macaroni is cooked, rinse with cold water and drain. 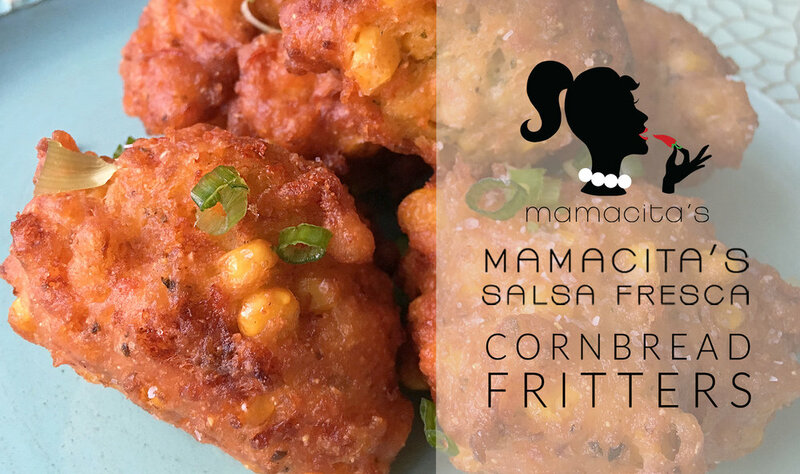 Mix it in a large bowl with the cheese, cream, Mamacita's Salsa Fresca, milk, and salt. Once its all combined, place a spoonful in a greased mini muffin or cupcake pan (this recipe makes approximately 4 batches of 24) making sure it fills to the top. Preheat the oven to 400 degrees and pop them in for about 20 minutes, or until golden and how you like them. Let them cool and serve! 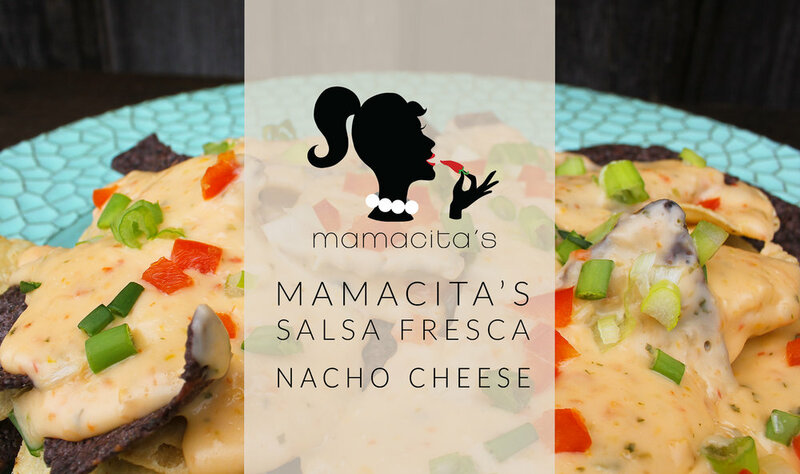 We loved the crispy cheese edges, but you could make more of a creamy sauce to mix with the noodles and Mamacita's Salsa Fresca to make it more moist, or just use your favorite base mac and cheese recipe with the salsa. We made two batches of bites, dumped the rest into a 9x13 pan, and baked the rest all together—it was just as delicious! 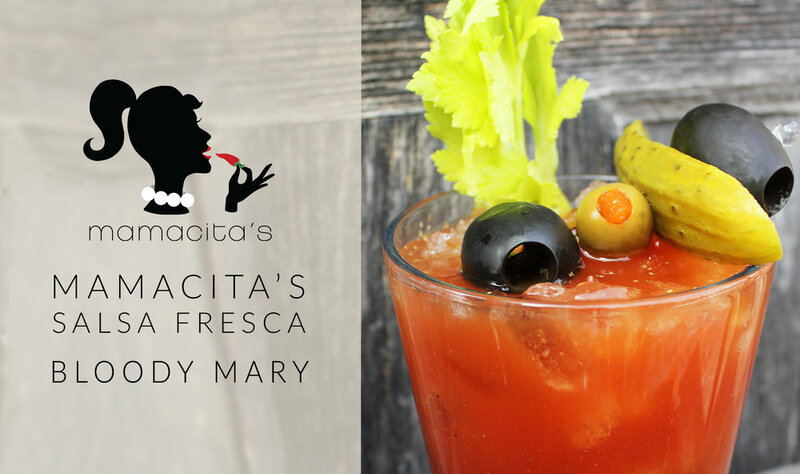 Mix together all spices, olive oil, and Mamacita's Salsa Fresca in a bowl. Pat shrimp dry with paper towel and toss in marinade until coated. Let sit for 15 minutes, then arrange on a baking sheet in a single later. Set oven to broil and broil the shrimp for 3 minutes. Turn the shrimp over and broil for another 4 minutes until the shrimp is pink and a little charred. First follow the directions to thaw puff pastry on package, around 40 minutes. 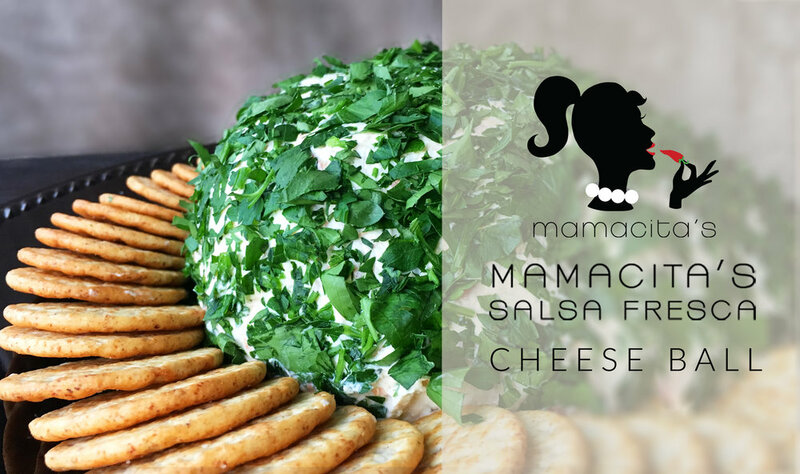 While it thaws, mix the cream cheese with Mamacita's Salsa Fresca, salt, and scallions together in a bowl until fully incorporated. There are three different hors-d'oeuvres you can make: either add the chicken, sausage, or cheese—whichever you like! Or triple the original recipe and make all three! In each circle, add about a teaspoon of filling. Whisk egg and water together to make a wash, and use either your finger or a pastry brush to brush all around the edges of the circle. Bring the sides of the dough together and pinch closed, creating a little ball. Place on a greased baking sheet, pinched-side down, and brush with more egg wash all over the top. Bake for 20 minutes or until golden brown. Quick Tip: Because pastry dough can't be re-formed like cookie or bread dough, you can't use the excess puff pastry dough for more circles. But our favorite trick is to brush the excess pieces of dough with melted butter, sprinkle with cinnamon and sugar, and bake until golden brown. Serve on top of ice cream or with some whipped cream for a quick dessert!